Missed this program or want to hear it again? Listen to the podcast on Alaska Public Media here. He is the founder and director of the Damascus Center for Human Rights Studies in Syria and co-founder and executive director of the Syrian Center for Political and Strategic Studies in Washington, D.C. He is the managing editor of the Transitional Justice in the Arab World Project. He is also a member of the Syrian National Preparatory committee for Transitional Justice. Ziadeh was a Visiting Scholar at Lehigh University, and Fellow at the Institute for Social Policy and Understanding (ISPU) in Washington D.C. Since the Syrian uprising started in March 15, 2011 he was involved in documenting the ongoing human rights violations in Syria and testified at the UN Human Rights Council in Geneva twice. He was also involved in the Syrian political opposition. 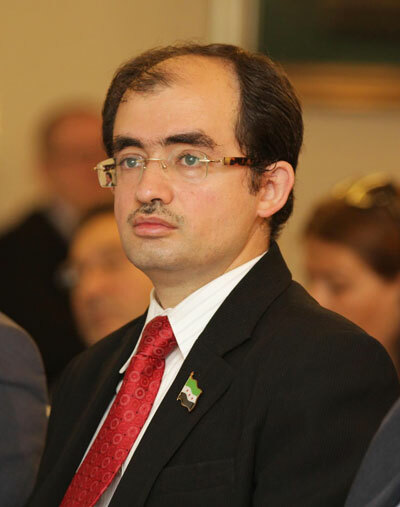 He was elected in October 2011 as director of the Foreign Relations Office of the Syrian National Council until he resigned from the position in November 2012. He was a Visiting Scholar for the Dubai Initiative at Kennedy School of Government of Harvard University, Visiting Scholar at the Institute for Middle East Studies (IMES) in the Elliot School of International Affairs at George Washington University, Prins Global Fellow at Hagop Kevorkian Center for Near Eastern Studies at New York University, and Visiting Scholar at the Center for Contemporary Arab Studies (CCAS) at Georgetown University. Before that he was a Reagan–Fascell Fellow at the National Endowment for Democracy (NED) in Washington D,C and Visiting Scholar at the Center for the Study of Human Rights at Columbia University in New York City. He was also a Visiting Fellow at Chatham House (The Royal Institute of International Affairs) in London and a visiting scholar at Carr Center for Human Rights at Harvard University (2008–2009). In 2007–2008 he was a Senior Fellow at United States Institute of Peace (USIP) in Washington, D.C.
Ziadeh was also editor-in-chief of Tyarat magazine in 2001–2002 and secretary of the Syrian Organization for Transparency. He was a researcher with the UNDP’s “Syria 2025” project and was named best political scientist researcher in the Arab world by Jordan’s Abdulhameed Shoman Foundation in 2004. In 2009 he was awarded the Middle East Studies Association (MESA) Academic Freedom award in Boston; and in 2010 he accepted the Democracy Courage Tributes award on behalf of the human rights movement in Syria, given by the World Movement for Democracy in Jakarta, Indonesia. Ziadeh was one of the major players in the “Damascus Spring,” a period of intense debate about politics, social issues, and calls for reform in Syria after the death of President Hafez al-Asad in 2000. He is on the board of directors for the Center for the Study of Islam and Democracy (CSID) in Washington, D.C., Senior adviser for the Institute of Islamic Strategic and Socio Political Affairs in London (IISA), and a member of the Advisory Group for the Institute for Democracy and Electoral Assistance (IDEA) in Stockholm, Sweden. In addition, he is a member of the Advisory Board for the Islamic World Initiative at USIP for “Reform and Security in the Muslim World” program, a member of the Middle East Studies Association (MESA), the American Political Science Association (APSA), The International Institute for Strategic Studies (IISS) in London, the International Political Science Association (IPSA), and the International Studies Association (ISA). His most recent book is Power and Policy in Syria: Intelligence Services, Foreign Relations and Democracy in the Modern Middle East (I.B.Tauris ,2011). He has written ten books: The Clash of Values Between Islam and the West, with Kevin James O’Toole (2010), Political Islam in Syria (2008), Decision Making and Foreign Policy in Syria (2007), The Challenges of Reform in The Arab World: Islam, Identity, Modernity and Globalization (2006), The Intellectual Confronts Power: Dialogues of Syrian Civil Society (2005), and The Near Peace: The Syrian–Israeli Negotiations (2005—the first book written by a Syrian on the subject), The Ideology of Renaissance in Contemporary Arab Discourse (2004), The Question of Renewal in Contemporary Islamic Discourse (2004), Modernism and Post-Modernism in Western Philosophy (2003), and Human Rights in the Arab World (2000). He has edited five books: The Democratic Transition between Spain and Syria, with George Irani (2009), The Struggle for Reform in Syria (2006), Reform in Syria: Between Domestic and International Politics (2004), Towards Civil Society in Syria (2004), and Islam and Political Thought: Democracy and The West (2000). Ziadeh has published studies, research projects, and policy papers for many international institutions including United States Institute of Peace (USIP), Institute for Democracy and Electoral Assistance (IDEA) in Stockholm, German Institute of Global and Area Studies (GIGA), The Netherlands Institute for Multiparty Democracy (NIMD), Freedom House and Global Integrity both in Washington D.C, The Global Leadership Project at the Clinton Global Initiative. He has published articles in magazines in Arabic, English, Spanish and French. He has lectured at Harvard University, Columbia University, Georgetown University, Stanford University, Rutgers University, Cornell University, George Washington University, New York University, UCLA, UC–Davis, Roger Williams University, Kennesaw State University, Tufts University, Oxford University, St. Andrews University, National Academy of the Sciences, King’s College–University of London, Edinburgh University, University of Colorado, Savannah Council on World Affairs, University of Ljubljana-Slovenia, Jagiellonian University in Poland, Lund University –Sweden, Gutenberg University-Mainz-Germany, University of Amsterdam, LUISS University in Italy , Pontifical Catholic University in Rio de Janeiro, Universitat Autònoma de Barcelona (UAB)-Barcelona, National University-Rosario-Argentina, International Christian University in Tokyo, Cairo University, American University of Beirut, Al-Baat University in Amman, University of Jordan, and Damascus University. He is a frequent political commentator on several U.S., European, and Middle Eastern media outlets such as Al-Jazeera, Al-Arabiya, B.B.C. and Al-Hurra. He also writes a bi-monthly op-ed for the leading Arab daily, Al-Hayat.